We recently heard from a customer that he had run out of ice melt, but didn’t have anything to put down for traction on ice that had accumulated on his walkway overnight. He said his wife thought of throwing down some Cleanfire Pacific wood pellets on the snowy/icy area – and they were pleased with the outcome! Of course, results and timing will vary based on the situation. But we think the idea of using a 100% natural wood fiber to make ice melt a bit quicker and to provide traction is great! 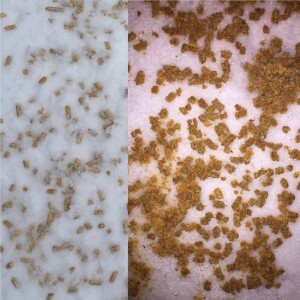 We decided to make a timelapse of wood pellets on ice to see what would happen. Here’s a sped-up close look of wood pellets soaking up moisture for about 20 minutes. You call us to help you create your personalized Flex Savings Plan. We designed this budget plan with our customers in mind – which is why you get to choose everything. You pick your start date, your monthly deposit amount, and the method of payment. Each month, on the date you chose, your deposit is automatically processed and stored as a credit on your Woodpellets.com account. You will be sent an email receipt, and you can always call us or simply login to track your Plan. Whenever you’re ready to order, your account credit is available to apply to your order balance. If you signed up during a promotion, you’ll receive Free Value Delivery on that order because you enrolled in the Flex Savings Plan! As long as your monthly deposit is at least $25, you can adjust the amount at any time. Call 1-800-735-5387 to Get Started Today! Free Value Delivery offer valid after 3 months of deposits of at least $25 or more, on orders of 3+ tons. Deluxe and Premier delivery have a small additional charge. Any remaining balance after credit is applied is due at time of order. Monthly deposit amounts can be changed at any time. Free Value Delivery offer cannot be combined with other offers.